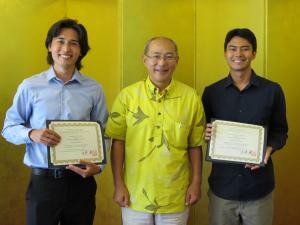 Raymond DeLang and Jake Yasumori, Japanese language majors in the University of Hawaiʻi at Mānoa Department of East Asian Languages and Literatures, were selected as recipients of the 2017–18 Monbukagakusho Scholarship from the Japanese government’s Ministry of Education, Culture, Sports, Science and Technology (MEXT). Last year, UH Mānoa Japanese language major Joseph Cardello was the only undergraduate in the United States to be awarded the scholarship. The Monbukagakusho Scholarship covers tuition, living expenses, and also provides stipends. The Consul General of Japan in Honolulu presented the scholarship awards to DeLang and Yasumori in a ceremony on August 30. The seniors will leave for Japan, where DeLang will be studying at Waseda University in Tokyo, and Yasumori will be studying at Doshisha University in Kyoto. DeLang is from Mililani, but was actually born in Machida, Tokyo, and lived there until he was 10. He chose to major in Japanese (and economics) in order to bring his language skills to a professional level. “First and foremost, I want to improve my conversation skills,” said Delang. “I also hope to create life-long connections with students and professionals of Japan. And, of course, I plan to use the Monbukagakusho Scholarship opportunity to enjoy the country of Japan to the fullest.” After DeLang graduates, he plans to pursue a juris doctorate degree and use his Japanese language skills in professional settings. Yasumori was born on Maui, raised in Kamuela on Hawai‘i Island and graduated from Kamehameha Kapālama Campus on O‘ahu. Majoring in Japanese wasn’t always his goal. He worked as a pharmacy technician and intended to be a pharmacology major. Eventually realizing this was not the field for him, Yasumori waited tables and saved enough tip money to take a three-month solo trip to Japan. “I figured that if the trip helped me place higher on the language placement test at UH then it was like making time and money,” he said. “I primarily did homestay around the Tokyo area and travelled frugally. It was an incredibly rewarding and crazy adventure.” Upon graduation, Yasumori will apply to the Japanese Exchange and Teaching program to return to Japan.